There are something like two dozen class action lawsuits floating around, against beer and spirits companies. Many are in the early stages. But information is starting to accumulate about the damages and fees at issue. For example, the Templeton Rye case is already settled, with about $750,000 in attorney fees going to the plaintiffs. The Maker’s Mark and Jim Beam cases are done, with nothing going to the plaintiffs. The Kirin beer case is wrapped up with $1 million in attorney fees going to the plaintiffs. 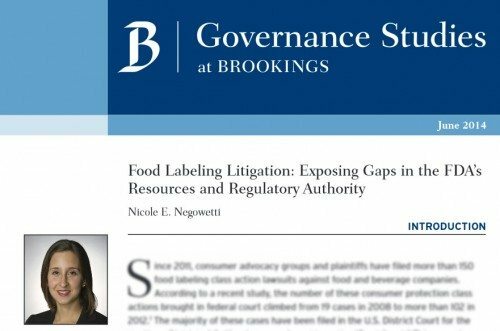 To get more visibility, about where all this may be headed, I looked beyond the alcohol beverage cases, to food labeling cases more generally. There are a lot of them. It turns out, there are so many, that they have provoked not only a blog, but also a study from The Brookings Institution, about a serious problem with a proliferation of suits about “natural,” “nutritious,” and “wholesome.” The Brookings study is of particular interest to me, not just due to the timely subject, but because I worked there briefly after college as a low level researcher. While researching for Stephen Hess, I sat with such (now) luminaries as Gary Mucciaroni and Robert Katzmann (when they were probably in their twenties). 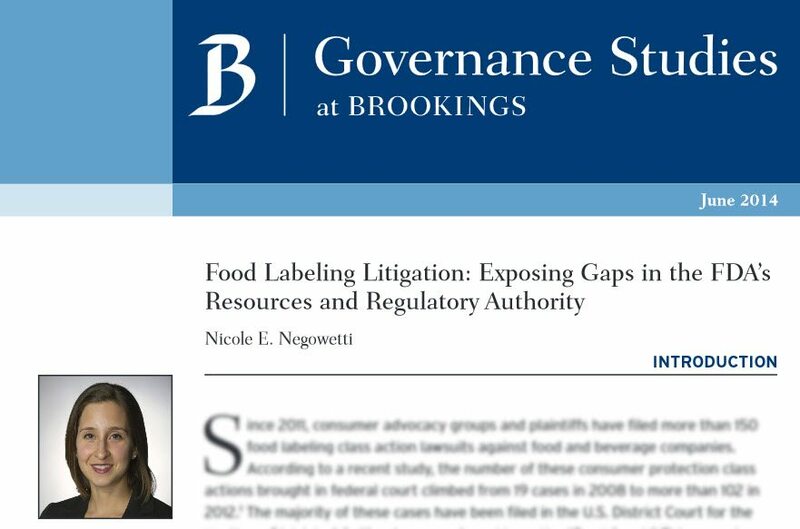 Nicole Negowetti, a professor at Valparaiso University Law School, surveyed the situation in “Food Labeling Litigation: Exposing Gaps in the FDA’s Resources and Regulatory Authority,” published in 2014. She tracked down the damages as shown in the table below. 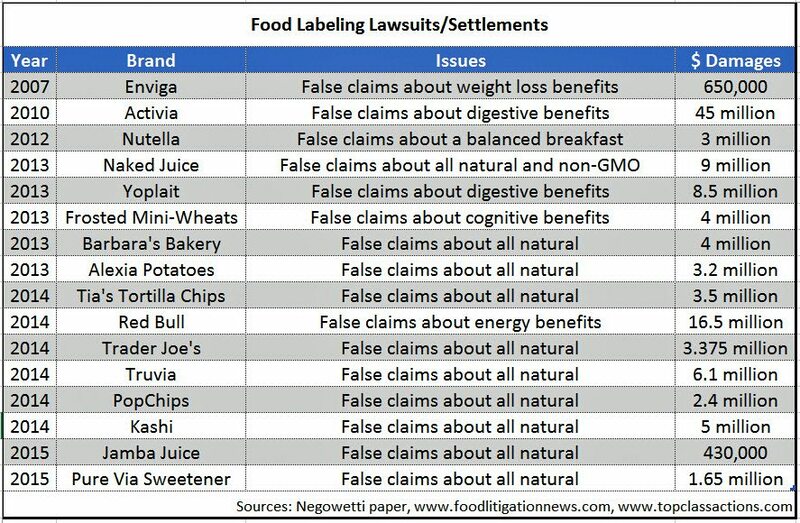 The majority of these cases have been filed in the U.S. District Court for the Northern District of California, now referred to as the “Food Court.” This surge in lawsuit filings has led some legal commentators to suggest that “food is replacing tobacco as the new regulatory and class action target.” This “unprecedented surge”of deceptive labeling and advertising lawsuits against the makers of products such as Naked Juice, Fruit Roll-Ups, Bear Naked Granola, and Wesson Oil, reveals a trend of regulation by litigation—that is, a turning over of food labeling issues to the courts in light of a lax regulatory system. 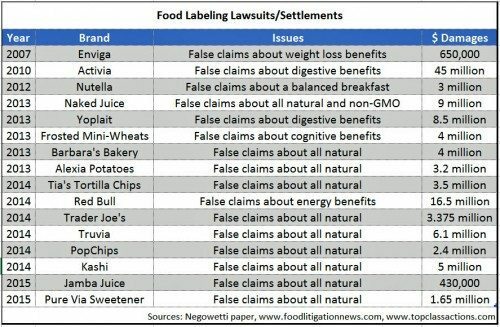 The government has been defanged so much that FDA has all but quit policing food labels. She points out that FDA can’t even or won’t even define “natural,” let alone enforce against most abuses. She also points out that, if you think rulemaking is expensive, wait until you see the cost of all these suits, passed along to you, dear consumer.